On Friday, October 5, 2018, the Putnam County School staff received some first class training on how to handle traumatic situations. The training was entitled Trutrauma. The lead presenter was Navy SEAL SOCOM medic Shane Anderson. This group travels around the world using the skills and knowledge they received during their service. They have done a tremendous job contouring the content to make it applicable and understanding to those that have little experience in these types of situations. He discussed and shared strategies on how to get your mind ready and how to try to handle yourself emotionally and physically in traumatic situations. 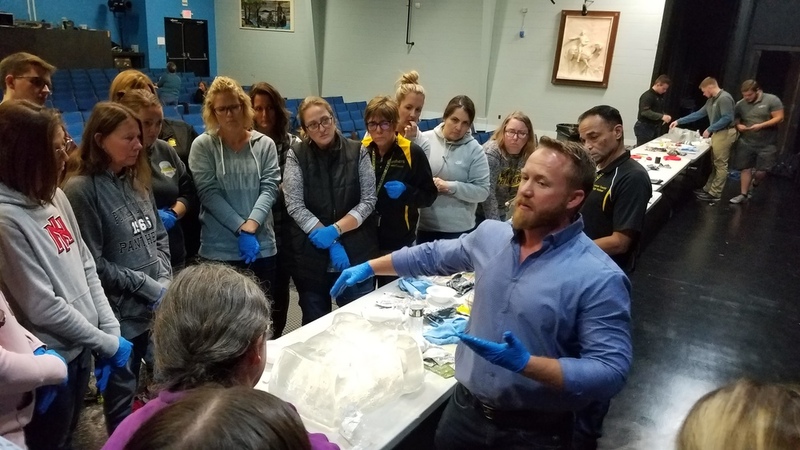 Shane also demonstrated how to assess an environmental situation, assess a level of need, prioritize resources, and ultimately to do the best you can. The staff practiced how to apply tourniquets properly. They also had hands-on practice of what steps to take in packing wounds and control bleeding. This was a detailed training aimed at trying to buy as much precious time in life threatening situations. As Shane stated, "We are not looking at turning educators into tactical surgeons. What we are trying to do is give you the skills to hopefully save lives during a crisis. This does not just apply to school violence. It can be applied during a natural disaster like a tornado or traffic accident at the mall. This will hopefully prepare your mind and train you to respond successfully." Dave Trudeau, of Clear Armor, was also in attendance. The district has been working closely with this group as we look at ways to make sure we are doing all we can to keep our students, staff, and communities safe. Overall, it was a great training and we are so appreciative of the willingness to work with our staff. We look forward to advancing our training and knowledge.